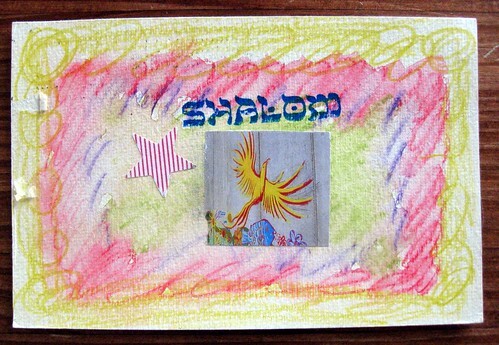 One of my smashing mail artist blog reader correspondents is also Jewish, and sent me this lovely mail art Happy New Year card for Rosh Hashanah. Heck yeah, I'm behind... I received it in October and now it's December, but I'm going for better late than never here, folks. I really like the bird. It feels like new beginnings. In Hebrew, Shalom means peace and is also used as both hello and goodbye. "The bird is from a photo sent to me to use in my collage for a book cover. I made many copies in various sizes, in order to prepare the collage. The book will be out in April 2010. The bird was painted by Palestinians in Gaza, children and adults, in an art project by Jewish Americans and Israelis. The wall was built within feet from the door of this particular family's home. The mural is to brighten their view and create a bond between Palestinians and Israelis. To see about the book, go to: http://www.osieonline.com/Announcements.html." Well I love this card. Shalom to you as well.